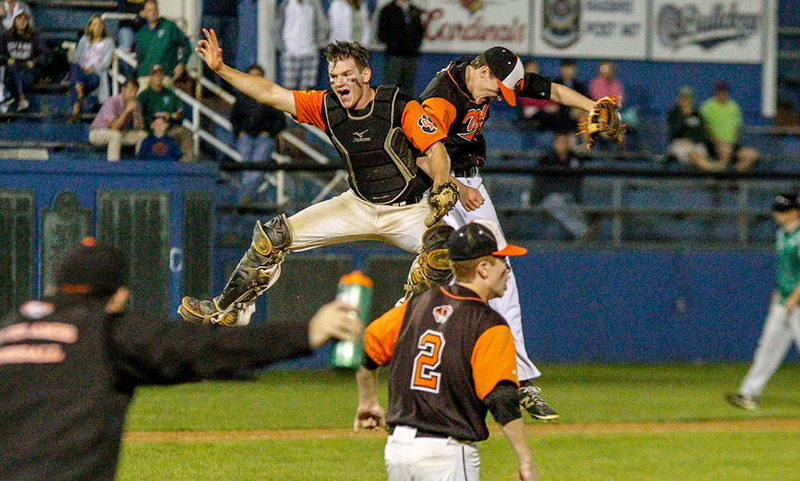 Stoughton, 5 @ Attleboro, 6 – Final – Stoughton jumped ahead 5-0 after an inning but the Bombardiers chipped away, tying the game and then walking off with the game-winner in the bottom of the seventh inning. Junior Alvaro Espinal knocked in Max Amaral with a two-out RBI single in the seventh for the winning run. Nick McMahon (3.2 innings) and Anthony Deyesso (3 innings, win) were stellar in relief for Attleboro. Foxboro, 0 @ Taunton, 6 – Final – Taunton senior Jack Moynihan earned the win on the mound and had a strong day at the plate to lead the Tigers to a win over visiting Foxboro. Moynihan tossed six scoreless inning, scattering four hits and two walks while striking out six to earn the win. Offensively, Moynihan went 2-for-3 with two RBI while Logan Lawrence had three hits, including a triple, an RBI, and two runs scored for Taunton. Freshman Tom Marcucella had two hits for the Warriors. Sharon @ Mansfield – Postponed to 4/11 at 3:45. North Attleboro, 1 @ Oliver Ames, 4 – Final – Oliver Ames scored two runs in the fourth inning to break a 1-1 tie and added another run for insurance to secure a 4-1 win over visiting North Attleboro. Jake Erlich (two doubles), Jared Spillane (two runs), and Sean O’Brien (who had a great defensive game) each had two hits for the Tigers. Reid Latham earned the win for OA, allowing just four hits and striking out four in 6.1 innings of work. Nick Boudreau picked up the save for OA. Attleboro, 7 @ Stoughton, 8 – Final – Stoughton outlasted Attleboro in a tight game to earn its second win of the season. Karly Estremera had an impressive day at the plate, hitting three triples, scoring three runs and recording one RBI while Bri Ferrandiz added three hits and two RBI. Jordan Lyons, Nicole Baker, Nikki Coppola (two singles), Sarah McGrath, and Sydney Menz all contributed hits for the Black Knights. Canton @ Franklin – Postponed to Friday, 4/12 at 4:00. Sharon @ Wellesley – Postponed to Friday, 4/26 at 4:00. Stoughton, 2 @ Attleboro, 3 – Final – Stoughton recorded wins at first and second singles but Attleboro swept doubles play and won at third singles to get the victory. Ryan Gordon won 6-2, 6-7 (9), 6-1 at third singles, the team of Jack O’Donnell and Eli Araujo picked up a 6-1, 6-1 decision at first doubles, and Tyler Evans and Ryan Solari teamed up for a 6-1, 6-3 win at second doubles. Stoughton’s Waseem Sablon won 6-1, 6-0 at first singles and Erik Anderson earned a 4-6, 6-1, 6-2 victory at second singles. Taunton, 2 @ Foxboro, 3 – Final – Foxboro earned two wins in singles action and one more in doubles play to notch a win over Taunton. Jason Kandula rallied for a 4-6, 7-6 (5), 6-1 win at second singles to secure the victory for the Warriors while Bo Canfield grabbed a 7-5, 6-1 win at third singles. The team of Brian Gardner and Sean McAvoy won 6-0, 6-2 at first doubles. Taunton’s Brett Beaulieu won 6-1, 6-1 at first singles and the team of Barrett Hodgson and Tyler Goddard won 0-6, 6-3, 6-4 at second doubles. King Philip, 5 @ Milford, 0 – Final – King Philip lost a total of four games in singles action in a sweep on the road over Milford. Marco DiStefano won 6-1, 6-1 at first singles, Nick Putney picked up a 6-0, 6-1 win at second singles, and Jack Cannon recoded a 6-1, 6-0 decision at third singles. The team of Nate Ihley and Zak Ryan won 6-1, 6-1 at first singles while Jake Mager and Andy Cook prevailed 6-4, 6-4 at second doubles. Stoughton, 1 @ Attleboro, 4 – Final – Attleboro won two singles matches and two doubles matches, all in straight sets, to defend home court against Stoughton. Ella Lynch-Bartek (6-1, 6-0) and Bri Aronne (6-4, 6-0) won at first and second singles, respectively, for the Bombarders. The team of Lauren Anthony and Nicole Matheson won 6-0, 6-1 at first singles and Jordan Benardo and Rena Danho secured a 6-4, 6-3 victory at second doubles. Stoughton’s Jess Podesta won 6-4, 6-3 at third singles. Foxboro, 4 @ Taunton, 1 – Final – Foxboro won all three singles matches in straight sets on its way to a victory on the road. Pam Nelson (6-0, 6-1), Sarah Prag (6-1, 6-4), and Julia Muise (6-0, 7-5) swept singles action for the Warriors. Kendall Milender and Paige Krockta earned Foxboro’s fourth point with a 4-6, 7-5, 10-2 win at first doubles. Taunton’s Ogechi Ariguzo and Kayla Parrett won 6-1, 6-2 at second doubles. Sharon, 5 @ Mansfield, 0 – Final – Sharon’s Lauren Glass won a super tiebreaker at third singles to help the Eagles complete a sweep on the road. Senior Nupur Shukla (6-0, 6-0) and freshman Valeria Barajas (6-0, 6-1) each won at first and second singles, respectively, while Glass secured a 2-6, 7-5, 10-3 win at third singles. The team of Sophia Fein and Sachi Basin won 6-0, 6-1 at first doubles while Sree Dandu and Makaila Cheung earned a 6-3, 6-2 win at second doubles. Attleboro, 50 @ Mansfield, 86 – Final – Mansfield’s Andrew Williams won a pair of events and took second in another, setting new personal bests in all three, to pace the Hornets to a win over Attleboro. Williams on the high jump (6’4) and the long jump (20’3″) while taking second in the 110M hurdles (16.7). Sophomore Anthony Comer was also a double winner, taking first in the 100M dash (11.0) and 200M dash (22.8.). Dan Knight (PR of 52.1), Tyler King, and Jack Rivard swept the 400M while Jason Windvogel (2:02) and Peter Oldow (2:06) went 1-2 in the 800. Patrick Heavey (4:40) and Pete Sullivan (4:41) finished first and second, respectively, in the 1 Mile. Canton, 81 @ Foxboro, 54 – Final – Canton’s Deyontai Dennis won three individual events and was a member of a winning relay team, pacing the Bulldogs to a win over Foxboro. Dennis took first in the high jump, the long jump, the 400M hurdles, and anchored the Bulldogs’ 4×400 relay team. Tommy Pulcini was first in the shot put and second in the discus while Junior Sainvil took first in the triple jump and the 100M dash, and second in the long jump and 200M. Oliver Ames @ Taunton – Postponed to Thursday, 4/11 at 3:45. Attleboro, 42 @ Mansfield, 94 – Final – Mansfield’s Amanda Mangano took first in three individual events and was a member of the winning 4×100 relay team in the Hornets’ big win over Attleboro. Mangano won the 100M (12.6), the long jump (16-3), and the high jump (5-0) while teaming up with Alexis Kiyanda, Emily Quitzau, and Zoe Plante to win the 4×100 (52.3). Julia Hill was a double winner, crossing first in the 400M hurdles (71.6) and the triple jump (34-2). Freshman Katie Miller won the 800M (2:30.8) and freshmen Maria Sevastos (64.3) and Anna Darlingto (64.6)n took first and second, respectively, in the 400. Canton, 51 @ Foxboro, 85 – Final – For Canton, Maddie Rousseau won the 200, the long jump, and the triple jump while taking second in the 100. Sarah Collins was also a double winner for the Bulldogs, grabbing the top spot in the 400M hurdles and the 400M. Chloe Pennacchio was second in the 1 Mile, 2 Mile, and the shot put. King Philip, 3 @ Bellingham, 0 – Final – King Philip used a strong serving effort to pick up a 3-0 sweep (25-8, 25-7, 25-17) against fellow first-year program Bellingham. Cam Corey had six aces while Kyle Desrochers finished with four aces. Attleboro, 36 @ Franklin, 57 – Final – Click here for a recap and photo gallery of this game. 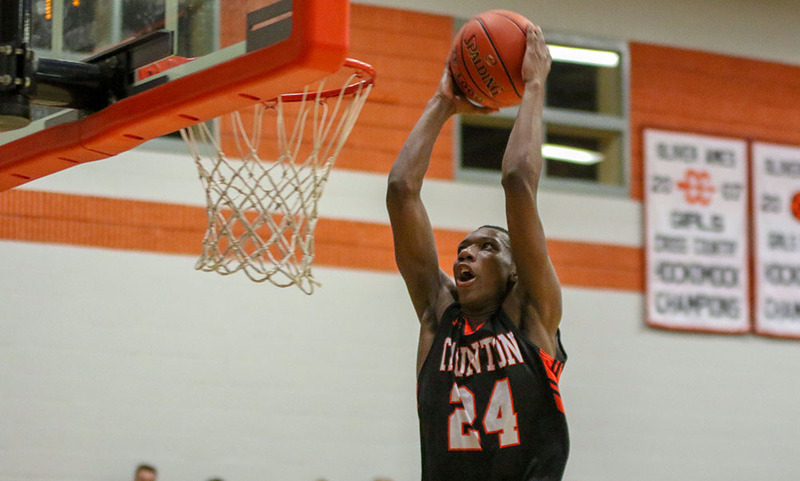 Milford, 46 @ Canton, 52 – Final – Canton senior Devin Foster poured in a game-high 28 points, including a three-pointer in the first quarter that made him the all-time leading scorer in Bulldog basketball history, passing Brian Pendergast (1,179 points in 2000). Foster (12 rebounds) scored 12 points in the opening quarter, and then 14 in the second half to help Canton turn a halftime deficit into a win. Milford led 23-20 at the break but the Bulldogs scored 18 points in the third to seize the lead (38-31) with both Ryan Lentol (10 points) and Robbie Gallery scoring five in the frame. Milford’s Brendan White scored 17 of his team-high 20 points in the second half and Danny Corsini added 14 points for the Hawks. North Attleboro, 47 @ Foxboro, 48 – Final – Foxboro senior Anthony Mollica sank both ends of a one-and-one situation from the foul line with 2.9 seconds to lift the Warriors to a win and a spot in the state tournament. The Rocketeers led by one after a 9-0 run and had the ball with 31 seconds left in the game, and 24 seconds left on the shot clock, but couldn’t extend the lead. Mollica drove to the basket as time ticked away and was able to draw a foul on the floor, with the Rocketeers in the bonus. North Attleboro led 26-20 at half and 36-33 going into the final quarter. An early run from the Warriors put the hosts ahead, leading 46-38. North responded with a 9-0 run, Josh Montague hitting back-to-back baskets to put the Rocketeers up 47-46. Foxboro junior Brandon Borde had a game-high 17 points while Mollica finished with 10, seven coming in the final quarter. Josh Porter, Ethan Friberg, and Jake Petersen each had eight points for North. Oliver Ames, 66 @ King Philip, 71 – Final (OT) – King Philip overcame a 22-point second half deficit to force overtime and shock Oliver Ames. The Tigers jumped ahead 34-21 by halftime, and extended the lead to as much as 22 before taking a 55-37 lead into the final eight minutes. King Philip held OA to just three points in the final quarter, dropping 21 points of their own to tie the game and force overtime. In the extra period, with KP up by two, senior Bruce Saintilus (27 points) hauled in an offensive rebound off a missed free throw and sank two free throws of his own to extend the lead to four with 10 seconds left to secure the win. Saintilus scored nine points in the fourth quarter comeback and was 6-for-6 from the line in overtime. Juniors Alex Fritz and Andrew McKinney each added 15 points for KP, who scored 34 points over the final 12 minutes after netting just 36 over the course of the first three quarters. Sean O’Brien had a team-high 14 points, Owen Friel added 12 points and Jake Erlich finished with 11 points for OA. Taunton, 56 @ Mansfield, 65 – Final – Mansfield pulled away late to secure the Kelley-Rex division title, a record seventh straight for the Hornets, surpassing Oliver Ames’ six straight from 1981-1986. Mansfield held a 16-13 lead after a quarter of play, and took a 30-27 advantage into halftime. Taunton continued to battle, taking a brief 41-40 lead late in the third and went into the fourth quarter tied 44-44. Mansfield made a 8-3 run over a three minute span in the fourth quarter to create enough separation for the win. Damani Scott had a team-high 15 points along with 11 rebounds, Sam Stevens added 13 points, and TJ Guy finished with 11 points. Taunton junior Dante Law had a team-high 21 points. Sharon, 36 @ Stoughton, 80 – Final – Stoughton combined to score 45 points between the second and third periods, running away with a big win over Sharon to qualify for the state tournament for the first time since 2012. The Black Knights connected on an impressive 31 two-point field goals, with 10 players getting on the scoresheet and six of them scoring nine points or more. Junior Obinna Ugwuakazi scored a team-high 13 points, sophomore Brett Pendenza added 11 points, senior Zak Paquette and junior Ahmad Jahed each scored 10 points, and senior Kevin Dixon and junior Myles Grigalunas-Powell each finished nine points. Aidan Kane had a team-high 12 points for Sharon. Franklin 54 @ Attleboro, 63 – Final – Liv McCall and Mackenzie Roberts both scored career-highs and Attleboro head coach Marty Crowley called the game a “phenomenal effort” by the Bombardiers to hand the Panthers their first league loss of the season. McCall scored 18 points and Roberts added 17 to lead Attleboro to the upset. Bea Bondhus had 13 points and Megan O’Connell had 12 for the Panthers. Canton, 58 @ Milford, 32 – Final – Canton matched its highest win total since 1995 with its 13th win of the season. Maggie Connolly led the way with 13 points, Sydney Gallery added 12 and Kiara Cerruti scored 11 for the Bulldogs. Foxboro 60 @ North Attleboro, 29 – Final – Click here for a Recap and Photo Gallery from this game. 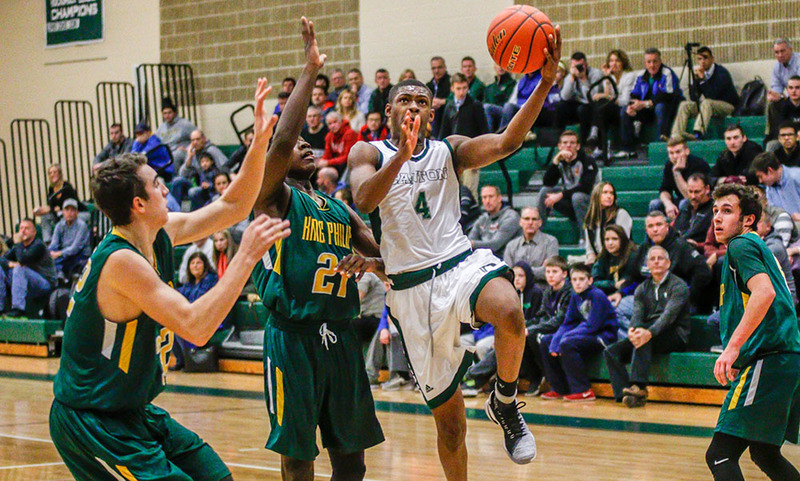 King Philip, 60 @ Oliver Ames, 69 – Final – A pair of underclassman each scored over 20 points for the Tigers, helping Oliver Ames fend off visiting King Philip. Sophomore Caroline Flynn had a career-high 25 points and hauled in 11 rebounds while freshman Caroline Peper scored a career-high 26 points for OA. Shannon O’Connor led three Warriors in double digits with 23 points, but KP couldn’t find a way back after falling behind early, trailing 32-23 at half. Brianna James scored 13 points and Faye Veilleux added 11 for KP. Mansfield, 47 @ Taunton, 36 – Final – Mansfield took control of the game in the third quarter, breaking open a 20-20 halftime tie by scoring 19 points in the third. Maggie Danehy scored 16 points and pulled down 12 rebounds and Sydney Mulkern added nine for the Hornets. Sonya Fernandez was the top scorer for the Tigers with 15 points and Lily Patneaude added eight. Stoughton, 46 @ Sharon, 55 – Final – Emma Eberhardt closed out the season with 15 points to help the Eagles sweep the season series with the Black Knights and finish with nine wins. Kaitlyn Wallace added 13 and Telishya Herbert had 10 in the win. Sophomore Sydnee Hyacinthe scored 18 points for Stoughton. TAUNTON, Mass. – Halfway through the third quarter, Taunton was in position to pull away with a win after extending its lead to a game-high 13 points at 39-26. But Oliver Ames refused to go away, closing the frame on a 12-2 run to make it a one-possession game with one quarter to play. The host Tigers carried that momentum into the final frame, tying the game on a triple from Jay Spillane (nine points) and going up 44-41 on a layup from Spillane and a free throw from Ethan Eckstrom (11 points, nine rebounds). After turning a 13-point lead into a three-point advantage with just under six minutes to go, it appeared all of the momentum was with the hosts. But Taunton delivered an immediate response as senior John Martins (nine points, three assists) converted a three from the corner while being fouled, essentially equalizing the momentum. Although Martins missed the free throw, he did connect on his next six attempts from the line to help Taunton come away with a 53-50 win over Oliver Ames. After tying the game, Taunton got a stop with Martins hauling in the rebound while being fouled. He sank both attempts to go up 46-44. After the teams traded empty possessions over the next two minutes, OA’s Jake Erlich (eight points, five rebounds) converted down low to tie the game with 2:56 to play. Martins drove a blocking call on the other end and hit both free throws to make it 48-46. OA had an inbounds pass just over half court but high pressure resulted in a loose ball and Quinn (11 points) pounced on it and went down the court for a layup and a 50-46 lead with 2:28 to play. Erlich got OA within two and Eckstrom tied the game with two free throws with just under a minute to go. Taunton ran a play to get Martins an open layup on the back side and he was fouled, again going to the line and hitting two free throws to make it 52-50. Taunton got another stop with Wesner Charles (eight points) hauling in one of his game-high 18 rebounds and Lou Vendrell hit one of two attempts from the free throw line with 23 seconds left to make it 53-50. Charles’ dominance on the boards helped Taunton win the battle of the boards, 34-22, and held OA to just six offensive rebounds. OA had two chances in the final 15 seconds to try and tie it but one three was off the mark and a turnover three as the buzzer was wide. Taunton opened the second half on an 11-4 run to turn a two-possession advantage into a 39-26 lead. Oliver Ames responded with pressure on the defensive end, extending its press out to create some chances offensively. OA’s Ryan Burkett converted a traditional three-point play with under 30 seconds left in the third to make it a one-possession game. “We went 2-2-1 [press] three quarter and had a couple of things happen that worked well for us,” Byron said. “We got them into a couple of trap areas and converted off of that. We played a smaller lineup for a good portion of that, going with three guards. Taunton led by one, 13-12, after the first quarter with Quinn and O’Brien each hitting a pair of triples. The visiting Tigers outscored OA 15-10 in the second quarter to lead 28-22 at the break. Taunton boys basketball (2-0 Hockomock, 2-0 overall) is back in action on Tuesday when it travels to take on Foxboro (0-2). Oliver Ames (1-1, 1-1) is also on the road, traveling to play North Attleboro (0-2).